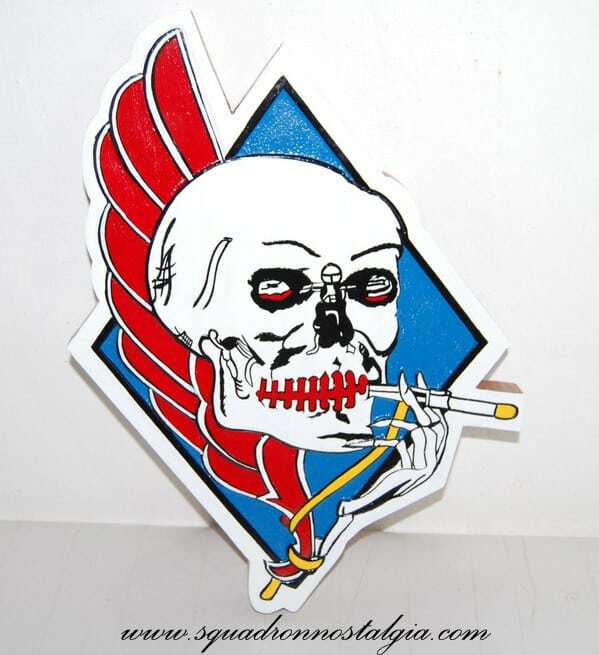 A beautifully carved 14 inch solid wood plaque of the VA-34 Blue Blasters! Show your aviation lineage with truly artistic craftsmanship of the Navy’s finest symbols. 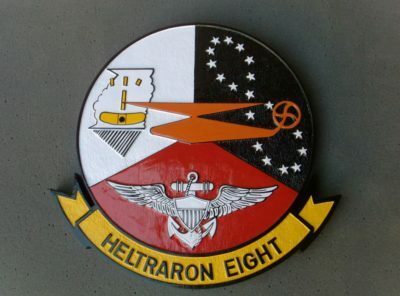 Established as Attack Squadron THIRTY FOUR on 1 January 1970. 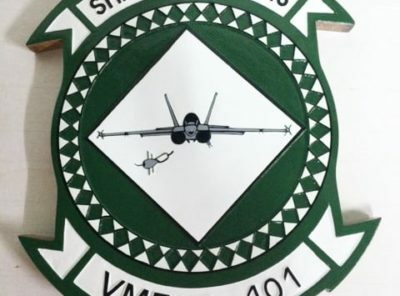 This is the third squadron to be designated VA-34. 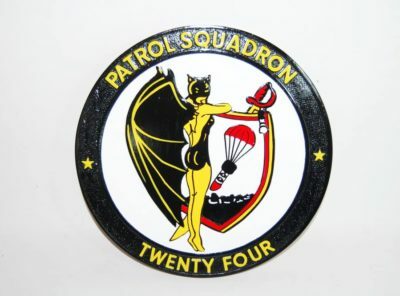 Squadron Insignia and Nickname When VA-34 was established, it adopted the insignia and Blue Blasters nickname used by the previous squadron. 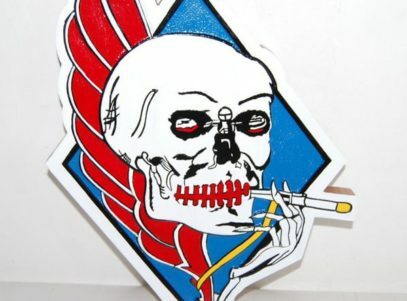 Colors for the insignia are as follows: blue diamond background outlined in black, red stylized wings outlined in blue and white, black and white machine gun in the shape of a cigarette, with a yellow ammunition belt and red bullets, white skull and skeleton with black markings and outline, red teeth, and red markings on the paddles. Three distinct US Navy squadrons have been designated VA-34. 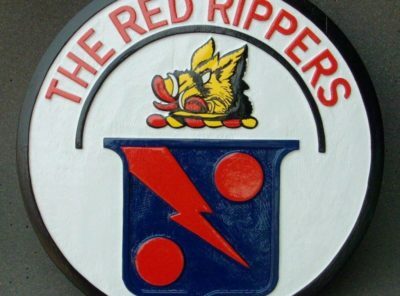 The first squadron to hold the designation was in 1948, this squadron was redesignated VA-35 in 1950. The second VA-34 was established in 1943 and disestablished in 1969. The third VA-34, established in 1970, was later redesignated VFA-34 and is the subject of this article. 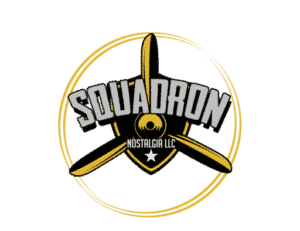 Officially, the US Navy does not recognize a direct lineage with disestablished squadrons if a new squadron is formed with the same designation.Often, the new squadron will assume the nickname, insignia, and traditions of the earlier squadrons. Less than a year after disestablishment of the second VA-34, a new Blue Blaster squadron was established at NAS Oceana, Virginia, on 1 January 1970 as the Atlantic Fleet’s sixth A-6 Intruder squadron. 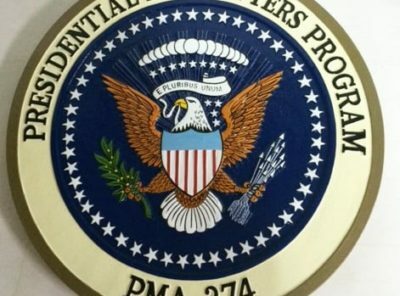 The actual establishment ceremony was conducted at NAS Oceana on 17 April 1970. On 18 September 1970, VA-34 embarked aboard USS John F. Kennedy as part of Carrier Air Wing One for a short at-sea period prior to its scheduled November deployment to the Mediterranean Sea. However, while en route to the Caribbean, the ship was ordered to deploy to the Mediterranean after Syria invaded Jordan. 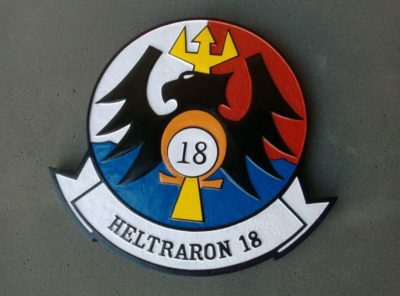 The squadron returned home in March 1971 from this unscheduled deployment, only one year old, but already in possession of the Meritorious Unit Commendation. In August 1971, VA-34 received the Battle “E” award as the Atlantic Fleet’s top A-6 squadron. In September 1972, a squadron A-6 Intruder conducted crossdeck operations on HMS Ark Royal while operating in the Norwegian Sea. Due to the outbreak of the Yom Kippur War, VA-34 and Kennedy departed the Norwegian Sea in October 1973 and re-entered the Mediterranean, conducting surveillance operations south of Crete.